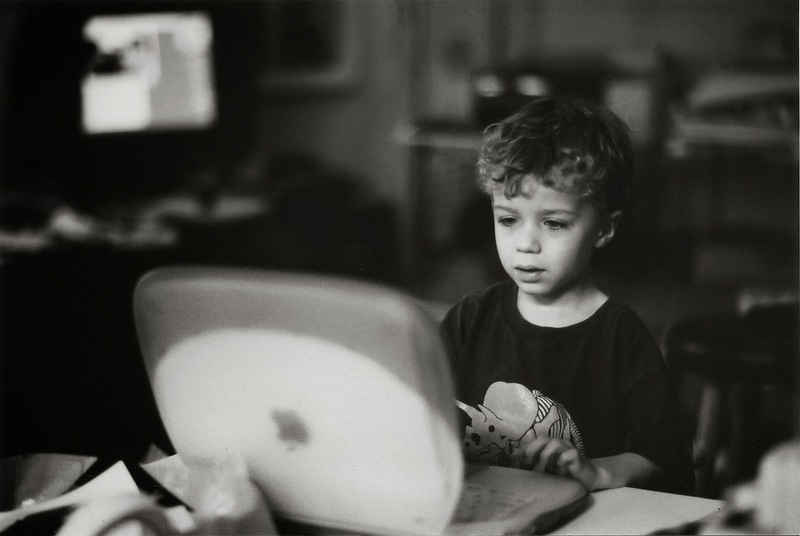 Young Ben working in the studio on his first laptop. One of my favorite medical practices here in Austin got in touch with me last week and asked me to update an environmental portrait of one of their doctors. We had done an entire campaign photographing each doctor doing what they loved to do in their off time. Hobbies, sports, crafts. You name it. The campaign was fun and I got to write the copy as well which meant that I really liked the entire package. We searched for schedule openings for both the doctor and myself and the only intersection that could happen quickly enough was to shoot this afternoon. We'll be meeting out on a soccer field to take the portrait. I'm taking the Elinchrom Ranger RX AS pack and a couple of flash heads with me to use. Since we'll be out in the middle of a big, remote field I'm pretty certain I won't be able to count on A/C current and I'd like a big pop of light in order to balance out the Texas sun. The Elinchrom Ranger RX AS system is my go to "portable" electronic flash set up for stuff like this. With it I can be in the middle of nowhere and still count on pounding out 1100 watts of flash power, through a huge soft box, at least 125 times in a row (before changing batteries). A lot more times if I set the recycle time to "slow." The pack is hefty. It weighs 18 pounds and it's not something I really want to carry very far. Today I plan to use it with a 28 inch beauty dish, covered with a white diffusion "sock." I've used the Elinchrom Ranger for nearly five years now and neither of the two battery packs I have for it show any signs of slowing down or losing their charge. It is also the most reliable set of lights I've owned. While the initial purchase price was high I have used the system for studio work and in hundreds of remote locations over the last five years to produce dozens and dozens of jobs. In fact, I used the system for a week long, location intensive, annual report project just a month after the initial purchase and it paid for itself on the very first job. While packing for the project I was struck by the contrasts in equipment. The Swiss made flash system is stout and heavy. Made to handle years of photographer abuse. It's cumbersome to carry but nothing beats that big blast of clean light when you need it. Especially when you are hellbent on taming the Texas sun. On the other hand I'm packing tiny cameras. I'll be using the OMD EM-5 camera today and I think I'll try using it with the 75mm 1.8 Olympus lens that I'm still playing with. The camera seems so tiny next to the beefy flash generator. But I guess that's the new nature of the business. The cameras have become almost an afterthought compared to the discipline of lighting. At least that's how it seems to me. editor's note: Kirk has been summoned for jury duty on Monday, Tues. and Weds. He may get out of it but he may not. That means the blog might be a bit spotty for the next few days. The following week is mercilessly over scheduled with wall to wall photo shoots right up until the minute he and Belinda head to New York on Thurs. to visit #1 son, Ben. It's a "parent's weekend" event at Ben's college. We should resume full on blogging enthusiasm around the 20th. In the meantime, if the web gets too boring, you might consider buying either the paperback version or the Kindle version of his fun novel, The Lisbon Portfolio. A big dose of Kirk's writing in a concentrated burst. Thanks for tuning in. Stick around to hear about the vagaries of jury duty and remember, if he gets dismissed the blog will return to normal this week. Focused on paying for someone's college fun are we? Two 30 pound standbags, I'm guessing that stand isn't going anywhere. I use the ~18 pound Vagabond II on the windy beach and that's been enough to hold the 28" bd and ~6 pound mono light in place.